Marc Marquez secured his third successive MotoGP championship after title rival Andrea Dovizioso crashed out in a dramatic moment at the Japan GP. Dovizioso handed Honda superstar Marquez a fifth MotoGP crown when he sensationally lost control of his bike on the penultimate lap at Motegi on Sunday. Ducati pole-setter Dovizioso was second behind Marquez before his bike washed out from underneath him at Turn 10 as the Honda team celebrated – the Italian rider crossing the line in 18th. The race for the championship looked set to continue at Phillip Island next month after Dovizioso – 77 points adrift of Marquez heading into the fourth-last GP of the season – led for most of the race and refused to let the Spaniard pull clear. Fans in Japan were about to be treated to a thrilling final lap after Marquez and last year's race winner Dovizioso continued to overtake each other. Marquez had leapfrogged Dovizioso, who momentarily dropped to third behind Cal Crutchlow, but the Italian moved back to the top immediately with 11 laps remaining. Dovizioso, however, fell behind Marquez again with three laps to go and it was a lead that he never relinquished after the former crashed. 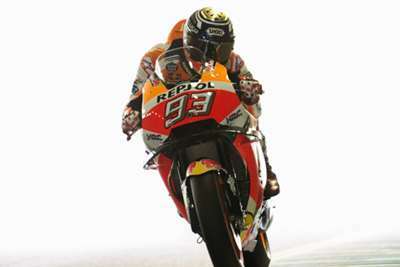 Marquez's Honda compatriot Crutchlow took second, ahead of Suzuki's Alex Rins, with Valentino Rossi fourth.